Best Natrual Remedy for Upset Stomach that Helps Relieve & Cure Symptoms of Heartburn, Acid Indigestion, Bloating, Gas Pain or other Digestion Problems. Best Natrual Remedy for Upset Stomach that Helps Relieve, Treat & Cure Symptoms of Heartburn, Acid Indigestion, Bloating, Gas Pain or other Digestion Problems. Formula for Digestion is a best herbal remedy for upset stomach that helps relieve many symptoms of heartburn. This natural vitamin supplement also help to alleviate gas pain in the intestines, acid indigestion, excess bloating, and other digestion problems. Stop Reaching for Mylanta, Tums, or Antacids. Get Immediate Natural Soothing Relief Today! Formula for Digestion helps accelerate the cleansing activities in the digestive system by featuring a balance & synergistic approach of natural herbs for indigestion treatment & stomach pain. This OTC digestive aid also contains a blend of complementary vitamins, probiotics, and digestive enzymes to help slow digestion, reduce intestinal gas bloating, and alleviate upset stomach pain after meals or after eating. Say Goodbye to Upset Stomach Pain & Bloating! Powerful blend of 14 well-researched & clinically substantiated herbs, special digestive enzymes, prebiotics, vitamins/minerals/amino acids, and nutrients to promote healthy GI functions. Our production methods result in the highest quality product which has a proven history of working very quickly. Category of Illness in the USA! Do not waste your money on other natural indigestion remedies or stomach inflammation treatment that have minimal effectiveness. This advanced natural digestion medicine and vitamin is GURANTEED to provide fast & natural cure for stomach inflammation, excessive gas bloating, or upset stomach pain. If not satisfied, simply return the bottle and get YOUR MONEY BACK! 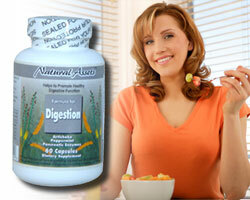 Formula for Digestion is the only all natural Triple Solution Digest Formula in the market! It offers a safe and quick relief of intestinal or excess stomach gas bloating. It's also an effective and healthy herbal cure for bloating, indigestion, belching, and heart burn. Break down foods to nourish the body, increase nutrient digestion and maximize absorption with 3 different top quality digestive enzymes. It helps ease stomach and intestinal discomfort, relieve acid indigestion, bloating, flatulence, and belching. Enzymes also play a role in delivering vital nutrients to the body's cells. Accelerate colon cleansing activities by promoting digestive bacteria growth and gut flora in the intestine with prebiotics FOS & Vitamin B Complex. A healthy population of these good bacteria in the digestive tract would enhance the digestion and absorption of nutrients, promote detoxification & elimination processes, and help boost the immune system. Carminative is a group of herbs that are known to be effective natural herbal digestion aids. They increase the secretion of stomach acids that help slow digestion, stimulate the release of digestive enzymes, and heal the stomach & gastrointestinal lining. By relaxing the linings of the stomach and small intestine, it is easier for gas to escape thus avoids bloating, belching, or flatulence. Some carminatives act as cholagogues that promote the flow of bile from the gall bladder thus helping fat digestion and absorption. Formula for Digestion contains 3 powerful carminative herbs. What More Can Formula for Digestion Offer? The best just wasn't good enough! We always wanted an absolute best and has taken our quality product to the Next Level. Formula for Digestion contains more powerful natural digestive nutrients than others. Most supplements for digestion contain two or three common digestive herbs such as Ginger and Peppermint, Formula for Digestion added six (6) powerful active nutrients & herbs for stomach pain / indigestion / heart burn / acid reflux such as Artichoke, Chammomile, and Fennel. Furthermore, Formula for Digestion includes three (3) different enzymes such as Pancreatine enzymes, pineapple Bromelain enzyme, and digestive enzyme Papain (from papaya) that are synergistically working together with the above herbs to quickly provide the viable herbal solution, treatment, and natural healing for indigestion, bloating, gas, belching, acid reflux, stomach pain, and heart burn. Lastly, we also include Prebiotics FOS and the B Vitamin complex (B1, B2, B3, & B6 ). These nutrients are necessary for proper absorptions of nutrients and formation of red blood cells. What What Makes our Ingredients So Great? All of our vitamins and natural ingredients are top quality and certified by our laboratory for safety and potency. Furthermore, herbs in our products are going through a special extraction manufacturing process to deliver at least 4 to 20 times higher potency than ordinary herbs' normal strength. This product contains all-natural ingredients that are safe and effective. It contains no chemically generated compounds, fillers or artificial additives. It does not require a prescription and without the negative side effects. All of the ingredients have been scientifically tested in clinical trials for their efficacy and safety. Ginger (Zingiber offcinale) has a long history of use as a digestive stimulant, upset stomach inflamation relief & natural cures for acid reflux. Ginger has no side effects and has the ability to provide aid for digestion, nausea, motion sickness, morning sickness & vomiting. Ginger has been shown in some studies to enhance intestinal lipase activity (helping to break down fats) as well as that of the enzymes sucrose and maltase. The German Commission E states 'no adverse effects' in its ginger monograph. The B Vitamins are necessary for healthy digestion, proper absorptions of nutrients, and formation of red blood cells. Digestive ailments & disorders are on the rise the US as a result of unhealthy eating habit of low-fiber, high-fat diet. According to the Centers for Disease Control (CDC), in 2003, there were 37.4 million and 15.2 million visits to doctors and emergency departments respectively for digestive problems. German Commission E has approved Artichoke as an alternative treatment for indigestion. Clinical research has shown that Artichoke helps to increase the structure and bile flow from & to the liver. Many digestive problems occurred when a decrease of bile flow is experienced. This includes bloating after meals, elimination difficulties (constipation), diarrhea, absorption difficulties of fat, and flatulence. 65% to 72% of patients experienced of improvement after 1 week & 80% to 92% after six weeks. Break down foods properly to help you eat more easily! As we age, our digestive systems become less efficient, causing indigestion and other stomach discomfort. Furthermore, when your stomach is loaded with acid food, it is unable to digest food in a reasonable time. It lacks enough digestive enzymes and hydrochloric acid to process heavy loads of food. Over time digestive enzyme production becomes depleted and you become limited in the response to digest food. In addition, while foods in their raw state contain enzymes for digestion, but heating and processing break down those enzymes, forcing the gut, again, to use more of its endogenous supply to digest food. Enzymes assist digestion by breaking food into its simplest form to nourish the body. Plant-Source Pancreatine Enzymes help to breakdown fats, proteins and carbohydrates (starch) into smaller particles, thereby increasing efficient food digestion. Besides maintaining digestive health, enzymes also allow individuals to maximize nutrient intake by efficiently absorb vitamins, minerals and amino acids. If pain occurs in the upper part of your stomach that gets worse after eating fatty foods, the cause maybe from deficiency of bile to digest fats. Digestive enzymes can help to stimulate bile flow. Pancreatine enzymes in the digestive system are a combination of protease, amylase, and lipase that help break down protein, starch, and fats. Digestive enzyme protease, secreted by the pancreas, function in digestion system by breaking down or hydrolyzing protein molecules into amino acids. Incomplete digestion of proteins creates a number of problems for the body including the development of allergies and formation of toxic substances. Amylase enzymes break down starch molecules (carbohydrates) into smaller sugars. Amylases is secreted by the salivary glands as well as the pancreas. Lipase, along with bile, breaks down lipids (fats) into essential fatty acids. Deficiency of lipase results in mal-absorption of fats and fat-soluble vitamins. In a study of supplemental enzymes, healthy subjects were given cookies with lipase enzyme or placebo. Those in treatment group experienced significantly less bloating, gas and fullness throughout the day compared to placebo. Order your Formula for Digestion Without Risk Today! Furthermore, as you get older, your stomach weakens in its ability to produce hydrochloric acid to digest protein. It is undigested protein that leads to acid reflux or heartburn. The plant enzymes of Bromelain founded in pineapple help digesting protein. Pineapples' bromelain support digestion, reduce inflammation, and help relieve the burning sensation or symptoms of heart burn, acid reflux or acid ingestion. Digestive enzyme papaya, which contains proteinase Papain, are also excellent for protein digestion. Both enzymes are best remedies & effective temporary natural treatments for heart burn and bloating gas. They help support a healthy digestion system & reduce digestive problems. They are also particular effective in lowering intestinal inflammation, as they become active in high temperature associated with the inflammatory response. Enzymes also play a role in delivering vital nutrients of the cells of the body. When supplemental enzymes are taken with a meal the body will actually manufacture less digestive enzymes and less work for the digestive system. People will often feel better, experience more energy and less digestive distress. Furthermore, enzymes are also playing a preventive role as taking them before a meal can prevent those digestive discomforts associated with eating too much, too fast, or eating "wrong" food. Fructooligosaccharides (FOS) is an insoluble beneficial fiber. It supports the expansion of beneficial bacteria in the intestines that form the structure of the Gastointestinal (GI) tract. Prebiotic FOS are indigestible but not for the bacteria in the gut. In the colon, FOS helps increase & feed the beneficial probiotic bacteria such as Bifidobacteria or Lactobacilli while lowering the family of toxic bacteria. The increase in "good" colon bacteria helps improve the immune system, maintain normal range of cholesterol levels, enhance healthy digestive system (nutrient absorption & detoxification), and even fight cancer. . In a review by the Universite Catholique de Louvain, Belgium, researcher founded that shorter chain FOS is beneficial for good digestive bacterial growth. An Austrian animal study also indicated that FOS has immunomodulatory effects that may increase the body's resistance to microbial infection. Furthermore, a research on rats found intake of FOS greatly lower the inflammation of the intestines by increasing the numbers of lactic acid bacteria. Colitis causes inflammation and ulcers in the lining of the large intestines. Prebiotics FOS has been shown to prevent the symptoms IBD (inflammatory bowel disease), improve bowel function by increasing stool frequency and stool weight, and reduce the risk of certain disease such as colon cancer. FOS also suppresses the harmful microorganisms in the intestine and improves elimination of toxic compound in the colon. Advanced Formula for Digestion is a best herbal remedy and an effective natural digestive aid formula for intestinal gas pain, excess bloating, upset stomach pain, indigestion, belching & flatulence. It 's also one of the best a temporary natural remedies for acid reflux (acid indigestion) & heart burn. ColonACH is a best natural colon cleansing therapy that promotes and maintain healthy colonic functions that Detoxify toxic waste and colon parasites in the intestinal tract, Promote healthy elimination and help relieve severe constipation, Increase healthy colon cells and tissues against cancer, Enhance the digestion and absorption of nutrients, Boost the body immune system, and Reduce gas bloating in the intestines and bloating. 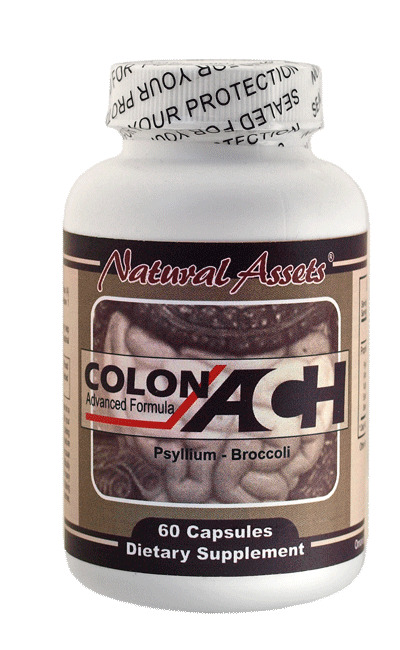 ColonACH contains 2 different dietary fiber to help ensure the proper passage of food and waste through the digestive tract and the elimination of waste from the body. Indigestion resulted from overeating, eating the wrong choice of foods, stress, or combination. If pain occurs in the upper part of your stomach that gets worse after eating fatty foods, the cause maybe from deficiency of bile to digest fats. Bloating - Gas buildup in the stomach and intestines. Gas is usually not a sign of serious illness & is a normal bodily function. Abdominal pain (mild and dull or sharp and intense) is a common symptom. Bloating can be caused by eating fatty foods, eating too fast, poor food selection, stress or anxiety, or growth of intestinal yeast. Flatulence occurs when when a food does not break down completely in the stomach and small intestine. As a result, the food makes it into the large intestine in undigested state. Gas such as methane, hydrogen and hydrogen sulfide (odor) are built-up in the colon because of the fermentation of these undigested foods in the colon, or occurrence of food residues in the colon. Therefore, when the intestines have difficulty breaking down certain component in foods, flatulence can be formed. Acid Reflux, acid indigestion, or heartburn occurs where the contents of the stomach (including powerful stomach acid) escapes a failed valve and comes in contact with the lining of the esophagus (the tube near throat area that carries food from your mouth to your stomach). It often described as "burning" sensation or feeling. Excess stomach acid can be caused by stress/anxiety, heavy smoking, alcohol use, caffeine, improper diet in high processed food, spicy or greasy foods, caffeine, or infection by pylori bacteria. When your stomach is overwhelmed with food, it's impossible for the stomach to properly digest quickly and naturally. This causes excess secretions of more acid in an attempt to dissolve this food. In fact heartburn has nothing to do with the heart - it is a digestive problem. Gastroesophageal reflux disease (GERD) is a chronic condition where ongoing symptoms, like heartburn occurs two or more times a week, or damage to the esophagus because of continual acid reflux. It is suggested that you consult your doctor for a professional consultation. Acid Reflux that's left untreated can lead to more serious medical problems. Heartburn, indigestion, stomach pain, acid reflux, gas, and bloating - are all symptoms which we experience from time to time. Heartburn symptoms of acid reflux disease often occur after meals. Symptoms can be greatly relieved or prevented by lifestyle and dietary changes as well as the use of natural nutrients and herbs known to promote healthy digestion & GI tracks natural healing. 2/ Dietary change may include avoiding certain high fat foods that cause acid reflux and trigger heartburn symptoms more than others. Citrus fruits, chocolate, fatty and fried foods, garlic and onions, tomato-based foods such as spaghetti sauce, chili and pizza, spicy or fatty foods. When you feel the burning sensation starts, drink an apple cider vinegar/water mixture, eat a banana, or eat half a cup of pineapple or drink the juice. Pineapple contains digestive enzymes Bromelain. Avoid foods such as beans, peas, lentils , cabbage, onions, cauliflower, bananas, and carbonated drinks. Eat less fatty foods since fat slows digestion. Avoid drinking large amount of liquids at meals unless you are on a weight-loss diet, since liquid dilutes your acids and enzymes. Light activity after eating such as walking. Recommended Use: As a dietary supplement for adults. Take one to two capsules before meal.